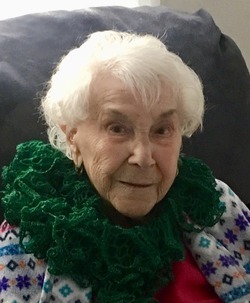 Elizabeth S. (Rogers) Waters, age 98, passed away on Saturday, May 19, 2018 at her home in Billerica, surrounded by her loving family, after a period of declining health. She was the wife of the late William Waters who died in 1991. She was born in Somerville on July 8, 1919, a daughter of the late Anthony and Julia (Ventura) Rogers. Elizabeth was a resident of Billerica and was formerly of Arlington and Lexington. She was a member of the Park Avenue Congregational Church in Arlington. Prior to her retirement, she worked at the office of Dr. David H. Gersh in Arlington for many years. Her family was everything to her and she loved nothing more than spending time with grandchildren and great grandchildren. Elizabeth is survived by her children, Nancy Rossi - Murch and her husband, David Murch, and Jodie Davies, all of Billerica, Janet Walters of Arlington and Joyce Rogers and her husband, Kenneth of Billerica; also many grandchildren, great grandchildren, nieces and nephews. She was pre-deceased by her son, William Waters Jr. and also by many brothers and sisters.